"No-one knows what's going on in somebody else's mind and life would be intolerable if we did." This quote perfectly exemplifies the premise of BBC2's new Belfast-set drama The Fall which looks into the hunt for a serial killer while also focusing on the killer himself. The killer in question is Paul Spector (Jamie Doran), a seemingly normal father of two who works as a bereavement counsellor. However, right from the off, we know that Paul is a creepy psychopath as he stalks round the house of young lawyer Sarah Kay (Laura Donnelly) before leaving her underwear lying on her bed. When Sarah arrives home she instantly phones the police but Paul has covered his tracks well and the police believe that Sarah is simply drunk and imagining things. But throughout the drama we see Paul continue to stalk Sarah and uses a trip to the park with his daughter to get close to her by sitting on a bench next to her and her sister. Paul compiles a dossier of information on Sarah which he hides in a tiny space in the ceiling of his son's room. As we the audience are the only ones who know about Paul's secret we worry every time he comes into contact with a young woman most notably the family's teenage babysitter. However, Paul may finally be tracked down with the arrival of a brilliant English Detective Superintendent who is brought to Belfast to investigate an earlier case. 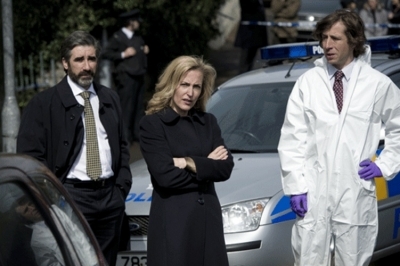 This DS is Stella Gibson (Gillian Anderson) who is drafted in by an old friend, Jim Burns (John Lynch), to review the investigation into murder of another young lawyer. As Stella's time in Belfast continues, one of the police officers she works with spots connections between the case Stella is reviewing and a previous investigation he was a part off. As Stella joints the dots between the two cases she discusses the possibility of a serial killer however Burns tells her not to pursue this line of investigation. But, despite his warning, she goes ahead anyway and notes that one of the elements that link both murders is the fact that underwear was left out. When she informs the rest of the station of this, the two officers who were called out to Sarah's house realise that they may have made a mistake. But will they be too late? Writer Alan Cubitt's motivation for writing the piece was due to his interest in the psychological background of various serial killers. He feels that The Fall is different to any other crime dramas around as we have an emotional investment in the killer. Cubitt also wanted us to get to know Sarah in this first episode as he wanted to avoid having a nameless and faceless victim. Producer Gub Neal agreed that The Fall is something special as it's a whodunnit in which we already know who the killer is. Cubitt adds that in a whodunnit we never know the killer's true motivation, but in The Fall we follow Spector from the get-go. Gillian Anderson claims that she wanted to be a part of The Fall as soon as she read the script as she found the character of Stella to be fascinating. Stella differs from other TV detectives in so much as we don't really get a glimpse into her personal life but rather mainly see her brilliance in solving murders. Anderson hoped that Stella would fit into the pantheon of great female TV detectives such as Jane Tennyson and Sarah Lund. It also appeared as if both Cubitt and Anderson were interested in bringing The Fall back for a second series however I'm guessing they'll have to see how well an audience responds to this first run.